Climbing the stairs to the platform is one of the most anxiety producing actions ever. Waiting to board, I chatter nervously. Heart racing, hands shaking and knees wobbling. A huge part of me wants to turn and run away as far as possible. But, she’s at my side and our turn is next. We’re in the first car. There’s no buffer between us and the unknown in this front seat. Stepping into the car, I take the inner spot. The metal bars come down around our shoulders. They are heavy and inflict pressure. We look at one another. As the mom, I’m trying not to show my fear. The roller coaster starts slowly…very slowly. Teasing us. Then we ascend. Inch by inch. A sound that tells me that we are headed for quite an experience. On a 90 degree angle, we are in the hands of gears and brakes that I hope work. My heart beats so hard; I can hear it loudly in my ears. I swear I can see her heart beating. A blue sky is all we see. Can’t envision what’s on the other side of the incline. As we level out, I look down – totally overwhelmed. A maze of twists, turns and curves. There’s no way to identify the route – no time to exit. The descent is fast and furious. Whoosh! Both of our heads hit the back of the car and our hair whips in many directions. Whish. We descend in less than 5 seconds. Lightening speed creates a blur. She and I grab one another’s hands tightly. Whoosh again. Rounding another curve. It’s happening so quickly that my mind can’t comprehend the full ride. Where are we headed? When will it end? Anxious. Fearful. Curious. Protective. Impatient. Overwhelmed. High doses of adrenaline keep me from passing out. Trusting that this metal bar will hold us in. I think this means the ride’s almost over. Thankfully. We enter the darkness, so black that I am comforted by closing my eyes. Her hand still holds on to mine. Ah – a speck of white light. It’s tiny, but gets bigger and bigger. Yes! We’re through. We made it. I look to my right. How can she be gone? But the ride doesn’t stop. This isn’t happening; it’s a bad dream. There’s chatter behind me so I know that other people are still on the ride. I have to go through again without her by my side. This time I ride with a broken heart. the dark tunnel – all without her. Alone in the front seat. I have no idea how long the ride will last. The bar is holding me in – protecting me. Trusting that she is ok without me. That someone is protecting her. …And this is what it was – and is like – for me to lose my daughter to cancer. Note: I wrote this blog post almost three years ago. 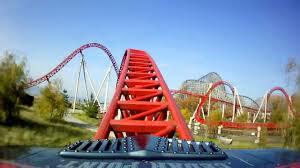 I still go through an emotional roller coaster – although the dips and turns may not be as dramatic. Trying to put words to an experience as painful as losing my daughter is difficult. I know some people try to enter my world and relate to my experience, but of course, they can only understand to a certain level. Unless, they’ve either cared for a child through a serious illness and/or lost a child. I do have dreams of my daughter. Some are tender and some dreams mimic the experience of this roller coaster ride – losing her in a crowd or she vanishes. So hard. Trusting in the strong arms of God that hold me tight, until I see her again. And grateful for many of you who stay on the ride with me. Almost five years later. Hang on with courage to your own ride – wherever it takes you. Stepping out of the car two days ago, my right foot hit a hole in the grass. The top of my foot turned outward and I felt a tendon rip. Unbalanced, I fell on my left side – hitting the ground – first, on my knee; second, on my hip; and third, on my elbow. Ouch! My immediate thought was, “Quick get up! Did anyone see me fall?” How completely embarrassing. Not knowing whether or not I broke anything, I forced myself to stay down. Scanning my surroundings, I didn’t see anyone. “Phew.” Ok, my pride was safe for the moment. Slowly moving to a sitting position, my body ached. My desire was to get back in the car. I was leaving for a fun adventure and didn’t want this fall to affect my entire afternoon. Could I just pretend this fall didn’t happen? A greater wisdom said, “Go in the house and look at the damage.” Slowly, I limped into the house and hobbled straight to the freezer for ice packs. Afraid to look at the damage, I lifted up the left leg of my jeans. It turns out that a large pebble caused a scrape on my knee. My right foot wasn’t swelling yet. As I iced these areas, I had a decision to make. Was I going to keep moving or stop and take care of my joints? With sadness, I chose to stay home. Why? Pain is an indicator of a bigger problem. This time my wound was physical. But reflecting on this goofy fall, I see a parallel to emotional pain. Getting up too quickly after a troubling experience, whether physical or emotional, is likely to create permanent damage. It really hurts. It just happened. I don’t know if it’s a sprain, or a dislocation, or a full break. If I don’t go slowly and check the soreness out, my activity is likely to cause greater damage to me or someone else. For example, if I got in the car with a broken ankle and tried to drive, my foot may have not been strong enough to hit the break and I could have missed a stop – hurting myself or someone else. It’s the same with emotional pain. After a trauma, if I go through the days immediately following as though nothing happened, my feelings may be impaired. I can hurt other people around me with words or actions that flow from the pain. Slowing down to think clearly is hard, but necessary. And, after a serious trauma, it may take much more than a few days of reflection; it may take months or years. When I’ve taken time to 1) stop, 2) assess and 3) respond – in this order – I have made better progress with a full, healthy recovery. I’ve learned, with the death of my daughter Leah, not jump to action after distressing encounters. While she was suffering and sick, it would have been easy to let my pain lead me by lashing out at doctors, nurses, social workers, family, friends, etc. when they were unclear, hurtful or selfish. Most of the time, I paused, waited and tried to think clearly before responding. I didn’t always get it right, but I think overall, I feel that I handled my responses to pain appropriately without damaging other people. When we pause and wait before we speak, we gain clarity and perspective. Especially if we feel wounded and betrayed. Our instinct is to either ignore, or move forward, or address the pain immediately. Sadly, a quick response can create a major tear in relationships. I see this especially with the use of email and social media as a way to respond to hurt and conflict. When triggered, online responses happen quickly and carelessly without much thought. Permanent damage to relationships results. Handling our injuries is tricky. When we don’t care for the wound, the pain seeps deep inside – becoming part of who we are. Acknowledging pain, as a sign of a deeper problem, helps us more fully heal. So, for two days, I’ve missed going to the gym to exercise. Fortunately, nothing is broken, no sprain, no major swelling, but I’m still sore. It’s hard to be patient. Waiting for the aches to lessen is helping me recover. I want to move forward on solid footing. Hope you take time to 1) stop, 2) assess and 3) respond to the depth of your pain. In this order. Another Christmas and New Year pass. It was the fourth Christmas without your bubbly excitement. One more year that the white stocking graced the fireplace mantle – replacing your handmade red and green one. The Christmas tree, filled with cupcakes and Eiffel Towers, was a type of memorial because it displayed things that you loved. The tree also proudly displayed ornaments both you and your brother gave us. We’d give you $5 to buy us a gift at grade school craft fairs. You’d proudly come home with brightly wrapped items. Back then, they seemed so modest and simple. Our last holiday season together, five years ago, was intensely precious. Not knowing how long you’d be with us, we soaked up every minute. Embracing, in a circle, at the stroke of midnight on New Year’s Eve wasn’t easy. It was hard for you to stand, because of your illness, but you did. You wanted to complete our family hug. And join in on our New Year prayer of gratitude. On February 20, 2014, I didn’t know how many years I could bear the grief of our broken circle. Losing you seemed to squeeze everything out of me. I haven’t given up, or given in to sorrow. I soak up joy with people who I love, wherever or whenever I can. Of course, it breaks my heart that you aren’t physically with me. and try not to focus on how sad it is that I have to do so. The number of Christmas’ that I haven’t seen you doesn’t matter. It never gets easier without you. One. Single. Bit. You are one of my best gifts ever. Your love of Christmas magic has a special place in my heart little miss. Yes, I made it through another year. Note: A friend of mine sent me an email after Christmas that began, “You’ve made it through another year.” These words touched me deeply. “She gets it,” I thought. Just these six words confirmed that she can only imagine the ongoing pain of losing my daughter. Her words are a special gift to me. While I don’t constantly talk about it, the sorrow of losing Leah is always present. Love for life and the people who I love keep me going.